Now that summer weather is in full force, make sure that you are treating the effects of summer time sweat. 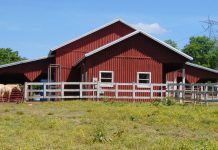 First, your horse should have regular access to clean, fresh water. Dump and scrub water troughs or plastic buckets once a week to ensure removal of algae and debris that may make the water less palatable. Second, make sure your horse is getting his required salt (talk to your veterinarian about his or her preferred supplement, be it loose salt or a salt block). Adequate amounts of water and salt will help keep your horse from becoming dehydrated. Finally, address that sweat that’s built up on your tack, particularly on the underside of the leather where it lies next to the horse. Remove it with a cloth dampened with clean water. More grimy sweat should be removed with the use of a genuine leather cleaner. Then nourish your tack with either a quick application of a glycerine-based product or affect a more thorough re-hydration with a leather restorer or conditioner. 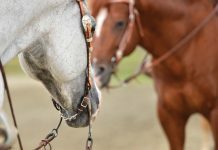 Summer time sweat can be harsh on your horse and your tack. But with a little vigilance you can beat the heat! During her lengthy show career on the hunter/jumper circuit, Cindy Hale won more than 20 medals for hunt seat equitation. She currently serves as a judge at local and regional open horse shows. Good short article, it helped me remember to clean my tack after every use. Great article! I ride a mare who sweats profusely, and was a bit worried when the insides of my field boots started going white :p once I figured out it was salt I had no idea how to clean it! Great artical, my horse is an easy keeper, so she is alway with a little extra weight that makes her sweat. Keeping her tack clean like the saddle pad is alway a chore, and i wouldnt have it anyother way… Clean for her.